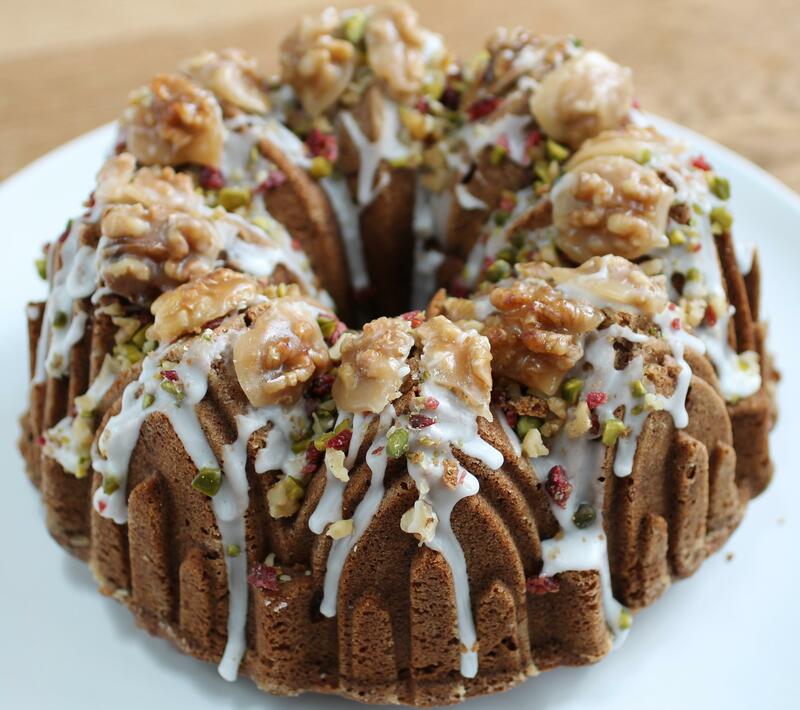 Great British Bake Off 2012 finalist Brendan Lynch’s ‘Spiced Bundt Apple Cake’ is a longstanding favourite recipe that both family, friends and neighbours frequently request. So when I asked him to try our spice mix in one of his recipes he was keen to make a Bundt cake with vandotsch speculaas spiced infused apples. Brendan Lynch came to prominence in late 2012 when he became finalist and runner-up during the third series of The Great British Bake Off. Brendan’s amazing skill, knowledge and passion captivated both the nation and Bake-Off judges: baking legends Mary Berry and Paul Holywood. 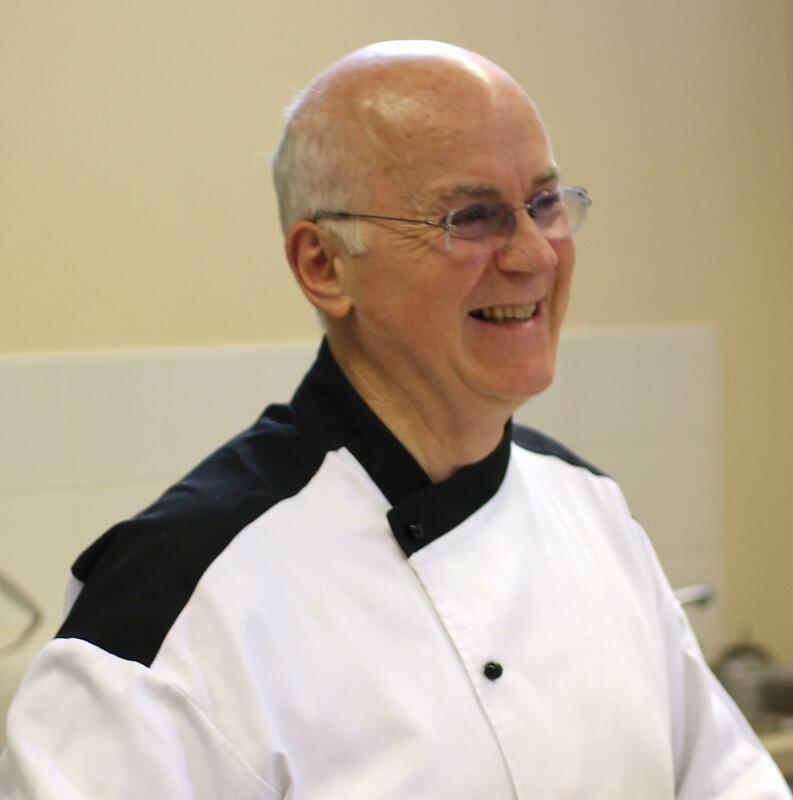 Born in Kells in Ireland in 1949, Brendan learned to bake with a Raymond Blanc book in his late twenties. He has been passionate about baking since his youth. In the decades since then, Brendan has taught himself from studying the books and trying the recipes of the great master bakers. Since the Bake-Off, Brendan has been busy with a range of projects. He regularly gives talks and demonstrations and judges baking competitions at venues throughout the UK and Ireland. Most recently he has taken to the waves as a demonstrator with Saga Cruises. Brendan also contributes recipes to magazines and his own website at Brendan Bakes. He can be found teaching baking at Seasoned Cookery School in Derbyshire twice a month, and at ‘Cooks’ Carlton Towers in south Yorkshire. 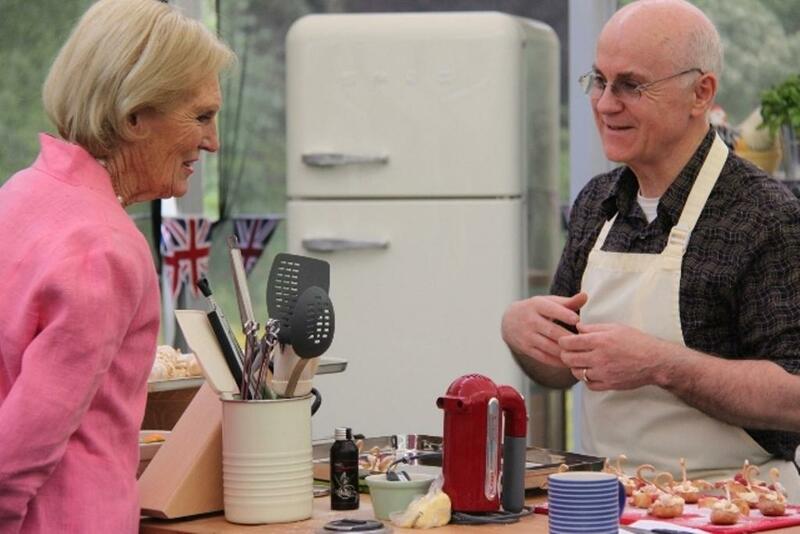 Appearing on the Bake-Off has helped Brendan achieve a particular ambition – to encourage residents of retirement homes to bake more and to use smells in Reminiscence Therapy/Work with a group of dementia sufferers. A Bundt cake is baked in a Bundt pan or tin, shaping it into a distinctive ring shape. 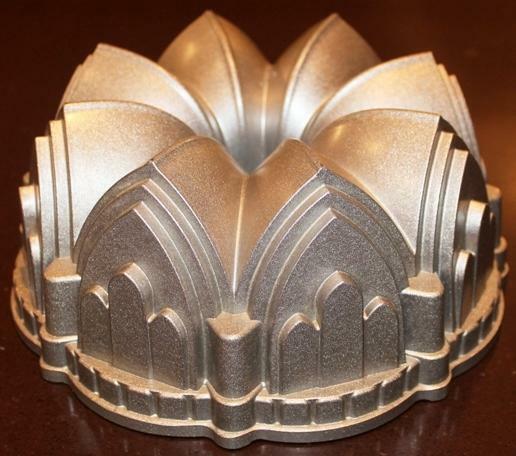 The shape is inspired by a traditional European cake known ashe Bundt cake derives in part from a European brioche-like fruit cake called Gugelhupf (marble cake) which was popular among Jewish communities in parts of Germany, Austria and Poland. In the north of Germany Gugelhupf is traditionally known as Bundkuchen, a name formed by joining the two words Kuchen (cake) and Bundt. What follows is an overview of the ingredients that Brendan used to make the vandotsch speculaas spiced apple Bundt cake. Makes one Bundt cake. Servings: 10 – 12. 125g dark muscovado sugar (rub between fingers to break up the naturally forming clumps before putting in mixer, otherwise finished cake could have clumps of sugar). Preheat oven to 180c. Melt 32g butter and using a pastry brush, butter and flour a 9” diameter, 2 litre Bundt tin. Tip: Do not oil spray the Bundt tin if the Bundt pattern is elaborate and intricate e.g. rose shape, crenelations etc, as it isn’t effective in the crevices and will cause sticking and spoil the finished look. Beat eggs, vanilla extract and both sugars in electric mixer until tripled in volume – 4-5 minutes. Add oil slowly in a steady stream with a few pauses here and there until it is all incorporated. The batter will be fairly thick. Sift flours, soda, and the spices into a large bowl. Mix thoroughly with a wooden spoon. Then add in batches to the creamed mixture still using the electric mixer now set on medium speed. Finally fold in chopped nuts and diced apple with a spatula or wooden spoon. Transfer to the prepared Bundt pan. (Mixture will be somewhat stiff). Put in pre-heated oven on middle shelf and cook for 1 hour. Check with a wooden skewer and if still moist, bake an extra 5-10 minutes maximum, but no longer to avoid drying out. Wait 10 minutes before turning cake out onto cooling rack. Let it cool thoroughly before applying water icing if using. Water icing with chopped pecans or walnuts (have the chopped nuts ready to sprinkle over icing while still wet. Press the pieces in gently where necessary). Mix sugar and juice to obtain a thick, pouring cream consistency – add a little more lemon juice if needed. Using a dessert spoon, drizzle the icing in a zig-zag pattern over top of cake. Sprinkle with the chopped nuts. 2 table spoons of water. Take all ingredients to boil stirring to ensure sugar and glucose are amalgamated. Boil for 10 minutes, or until it reaches a light amber colour. Take off heat and add in whole pecans. Working quickly, swirl nuts around in mixture and using 2 forks pick up each nut and place on prepared, greased tray. Let cool at room temperature, 30 minutes is sufficient. When ready, place the buttered nuts symmetrically on top of the cake working with the design of the mould. You will have enough toffee syrup to make extra nuts, say 24 and these will keep in an airtight container for up to 3 weeks. Tip: The cake will rise and form a small dome. To have it rest flat on serving plate, cut dome off carefully with a sharp serrated knife when the speculaas spiced Bundt cake is completely cold. Then proceed to the chosen finish.